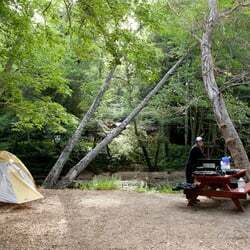 Riverside Campground & Cabins offer 40 sites for tents RV's and 12 Cabins along the Big Sur River on 16 Acres surrounded by majestic Redwoods. Beach access and hiking trails are just 10 minutes away. We are located only 22 miles south of Carmel-By-The-Sea and 68 miles north of San Simeon. Picnic tables and fire pits are on each campsite. We have hot showers, laundry facilities, and clean restrooms.You may swim in and inner-tube down the river. Fishing is seasonal and catch-and-release November through February. We provide 20amp electricity and water hook-ups for each RV site. Our cabins and rooms are equipped with queen and/or double beds and beautiful natural wood interiors. Shared or private decks are available.